The first scheduled opportunity for the Mars Science Laboratory to tweak its trajectory on the interplanetary cruise from Earth to the red planet won't be needed for awhile, flight controllers announced Thursday. The car-sized rover, packed inside the protective descent capsule, was successfully blasted off from Cape Canaveral last Saturday atop the powerful United Launch Alliance Atlas 5 rocket at 10:02 a.m. EST (1502 GMT). 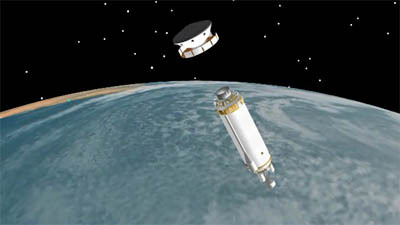 Following a pair of firings, the cryogenic Centaur upper stage released the spacecraft on the Mars-bound flight path 44 minutes after launch. Officials at the Jet Propulsion Laboratory in Pasadena, Calif., had been preparing for a possible course-correction maneuver 15 days after launch. But navigators have determined the trajectory is spot-on and needs no refinement right now. "This was among the most accurate interplanetary injections ever," said Louis D'Amario, mission design and navigation manager for Mars Science Lab. Engineers tentatively plan to execute a maneuver in late December or early January to begin the process of steering the spacecraft toward Mars. A burn in early June will start eyeing the precise landing site. As with any planetary launch, the rocket actually aims off-center from the target. In this case, the Atlas put Mars Science Lab on a track to miss Mars by 38,000 miles to ensure the Centaur upper stage that is following the spacecraft won't hit the planet. The rocket motor wasn't subjected to the thorough cleaning to prevent Earth's microbes from contaminating Mars, thus the deliberate effort to prevent an impact. The pre-planned trajectory for this mission included 6 correction maneuvers that would use 8 thrusters located on the donut-shaped cruise ring atop the spacecraft. The last could occur as late as 9 hours before landing to fix any errors prior to entry into the Martian atmosphere. Meanwhile, controllers reported that the spacecraft experienced a computer reset Tuesday because of star-identifying software in the attitude control system. The glitch resulted in the craft briefly entering a precautionary safe mode. "Engineers restored it to normal operational status for functions other than attitude control while planning resumption of star-guided attitude control," NASA said in a statement. Also on Tuesday, the onboard thrusters were fired to reduce the craft's rotation rate from 2.5 rotations per minute to 2.05 rotations per minute for the cruise. By mid-day Friday, the spacecraft will have traveled 10.8 million miles of its 352-million-mile trek to Mars, moving at 7,500 mph relative to Earth and at 73,800 mph relative to the sun. Mars Science Lab is communicating with Earth at a downlink rate of 25 kilobits per second. Electrical output from the cruise ring's solar arrays is 800 watts.